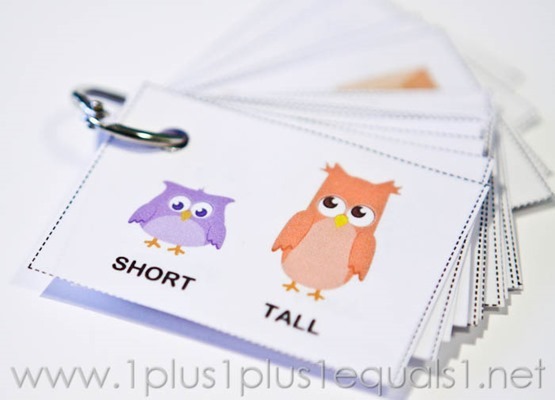 Encourage your students’ cognitive, language and word recognition skills with this free Owl Opposites Flashcards Printable from 1+1+1=1! Laminate or print on cardstock for longer use and attach on a metal ring to keep the cards all together. 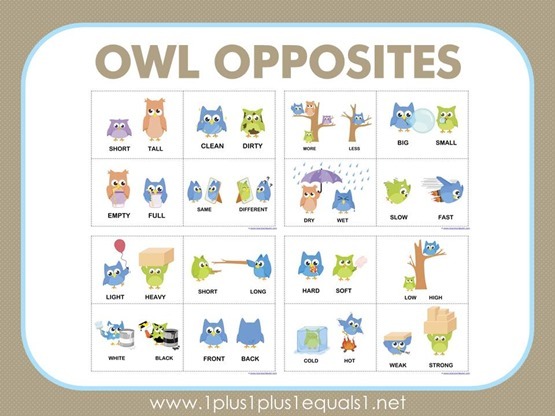 To print out your free Owls Opposites Flashcards, click here. We hope you and your students have a hoot with this printable! Help students develop expressive language skills through the use of opposites and adjectives with these flashcards and puzzle sets! This week, you can also take 15% off any of these four great sets. Just apply promo code OPPADJ at check-out! Adjectives: Opposites present both the concepts of adjectives and opposites, making this a truly useful and versatile set. These are the right adjectives to teach the young learner new language concepts. The set of 46 photo cards include: front, back, young, old, big, little, cold, hot, clean, dirty, few, many, near, far, tall, short, and more! Opposites Language Cards teach 10 different pairs of common opposites, including together/apart, dirty/clean, open/closed, thick/thin, and more. Each opposite is presented in a clear, non-distracting way in two different contexts to aid in generalization skills and help children understand different situations. Opposites Fun-to-Know® Puzzle contains 48 puzzle pieces to create 24 different pairs of opposites and help teach cognitive skills and build word recognition. Each puzzle is self-checking. Adjectives ColorCards contain beautifully clear large-format cards that illustrate a variety of adjectives in a side-by-side comparison. he concepts and vocabulary relate to common experiences and have been selected for use with a wide range of students with varying language abilities. 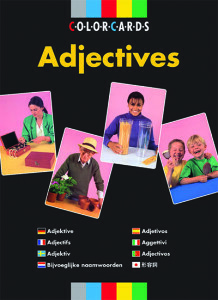 There are multiple examples of each Adjective for generalization exercises. Each of the 48 cards measure 5 ¾” x 8 ¼”. View the entire sale here. *Offer expires on April 5, 2016 at 11:59pm EST. Not compatible with any other promotions or on past purchases. Be sure there are no spaces or dashes in your code OPPADJ at check-out! 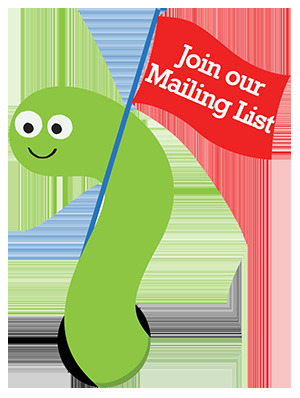 Call (800) 853-1057 with any questions.